Acoustic ceiling texture is very popular in homes built in the last few decades. Certain geographic locations also favor this style. This type of texture is done by putting styrofoam beads in the drywall mud and then using a special hopper to spray it on the ceiling. Homeowners will probably not have the equipment or the expertise to perform this type of operation themselves. For related information, see the articles 'How To Repair Drywall Texture', 'Drywall Patching' and 'Taping and Mudding Drywall'. All is not lost though. 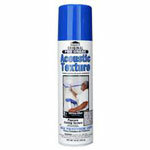 There are aerosol products available for patching this type of texture. A can runs around fifteen dollars and will cover about six square feet, depending on the density of the bead pattern. Purchase a can and follow the instructions for making you repair. Just like all of the other textures mentioned, some experimenting is needed to get a good match. The repair cans are expensive, so use the material gingerly. All done? Good job, you texturing drywall project has succeeded.